The icing on top is lavender flavored (not colored) and gives it that extra depth of flavor that is surprising and satisfying. Enjoy! Place sandwich cookies in a plastic freezer bag. Mash them with a meat tenderizer until fine or pulse in a food processor. Heat butter in a pan and mix cookies in with the butter until thoroughly mixed. With a large spoon press cookie mixture into a 9inch spring form pan coated with nonstick cooking spray. Make sure its evenly distributed and firmly pressed. Set aside in refrigerator to cool while making mousse. Meanwhile, melt chocolate in a microwave safe bowl starting for 30 seconds. Stir and then repeat until chocolate is just melted. Set aside and allow to cool slighty. (Note: The melted chocolate will melt the whipping cream if not cooled down. But if its cooled too much it will start to re-harden. Dip your finger in the chocolate and if its warm but not scalding then your good to go. It should measure between 105-110 with an instant read thermometer.) As the chocolate is cooling, whip up your whipping cream. Pour cooled chocolate into whipped cream and mix until combined. Pour mousse into springform pan with crust. Let refrigerate over night covered. Icing: Combine sugar & meringue powder together. In a stand up mixer combine shortening, vanilla, lavender flavoring and water. Slowly add in sugar mixture until combined. If too thick add water – if too running add more sugar. Spread on top of pie or pipe your choice of decoration through a icing bag. Enjoy! This looks wonderful. If you ever have extra you know my number :). Excited to see what else you post. Your such an awesome women. As a fellow chocoholic I can seriously say that I’ve just fainted! It look stunning. 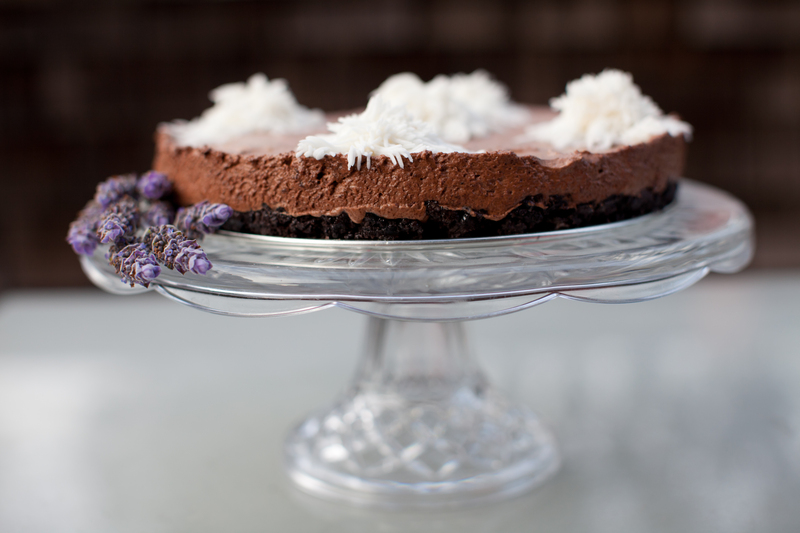 I’m also a big fan of lavender cream…I think softly whipped it goes really well with flourless chocolate cakes too.